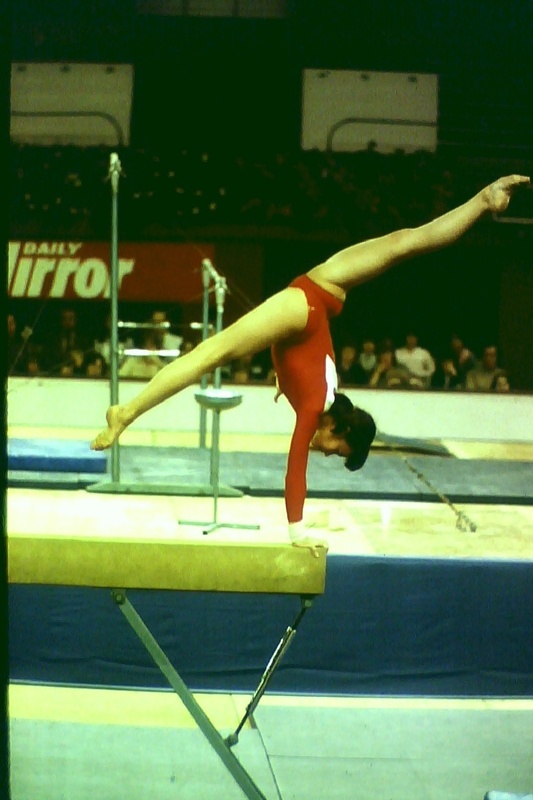 In the 1970s and 1980s I was fortunate enough to have a press pass which got me admission to report on all the main gymnastics events in Britain and Europe. I would regard this period as being the golden age of the sport. 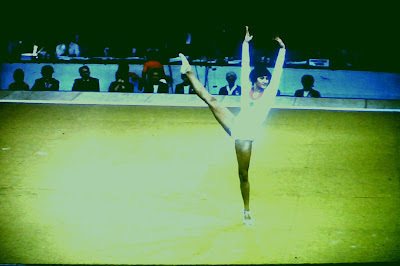 Almost all the most famous acrobatic moves of the sport originated then, there was excellent media coverage, Britain hosted several elite competitions, and a display team from the Soviet Union performed at the old Wembley arena every year. We saw all the top stars: Tourishcheva and Korbut, Comaneci and Ungureanu, Andrianov and Detyatin, Kurt Thomas and Kathy Johnson. But I always enjoyed watching the Russian girls the most. Here are a few pictures I took of them which hold particular nostalgia. This is the women's section of the Soviet display team at Wembley, autumn 1976:- Davidova, Korbut, Grozdova, Koval, Kim, Tourishcheva, Saadi. Truly a world-beating combination! 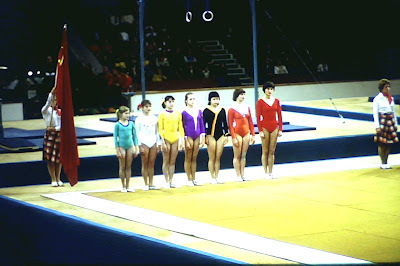 This team won the overall competition at the 1981 World Championships in Moscow:- Ilyenko, Polevaya, Sakharova, Davidova, Filatova, Bicherova. 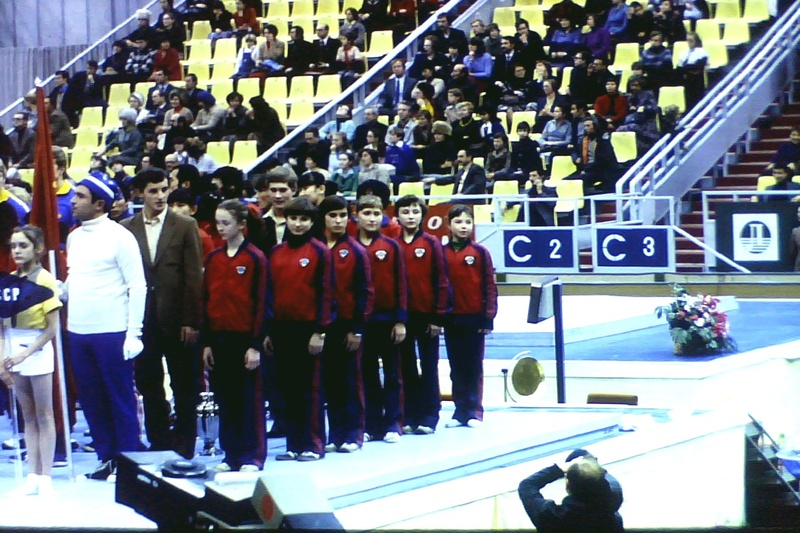 All of them except Polevaya also won individual medals. 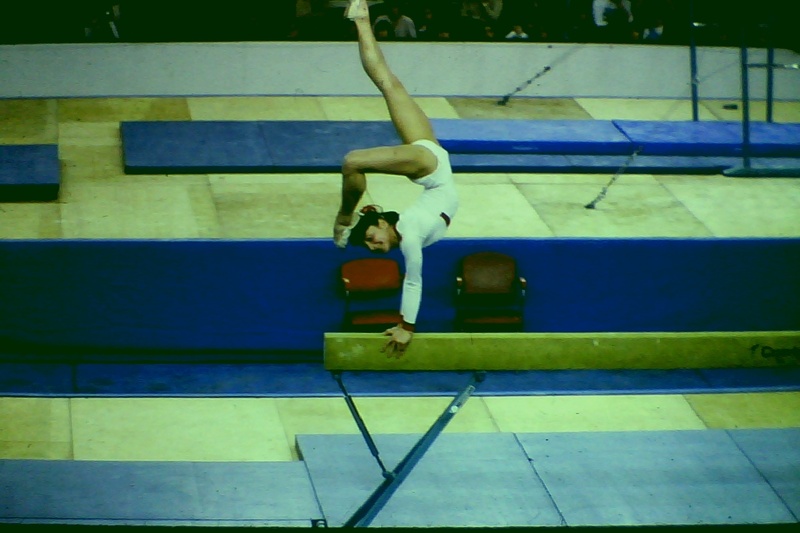 Olga Korbut, the girl who started it all, in London at the 1973 European Championships. She had to drop out halfway through with an ankle injury. 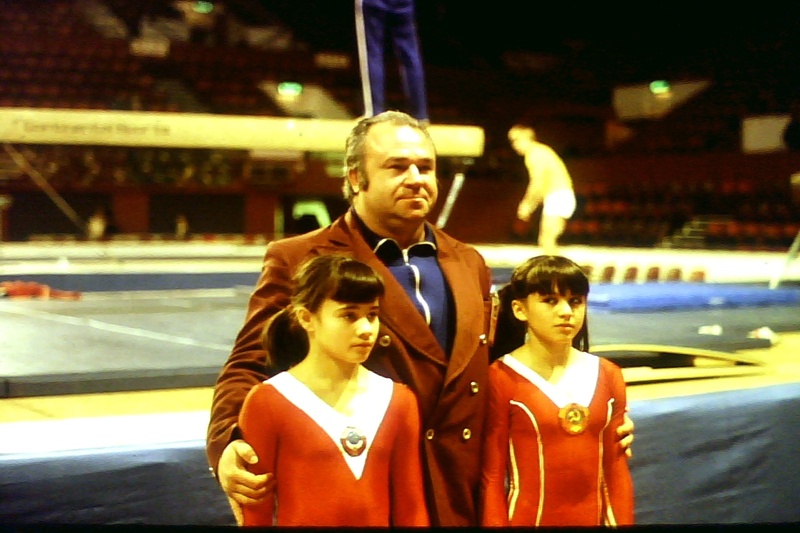 Vladislav Rostorotsky, one of the greatest coaches of all time, shows off two of his protegees; Shaposhnikova and Yurchenko. 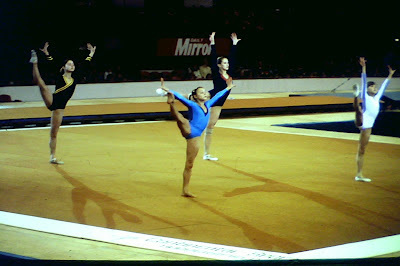 The displays always started with a group warm-up routine. Shown here: Grozdova, Filatova and Davidova, but I'm not sure of the identity of the girl at centre back. Can anyone help? Nelli Kim performs a turn on top bar. 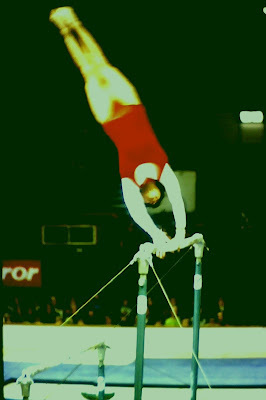 In those days the bars were positioned much closer together than now. Olga Bicherova, winner of the All-Around individual title at the 1981 World Championships. 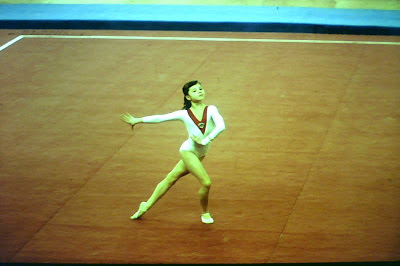 She was exceptionally tiny, even for a gymnast, and many of us suspected she was really too young to be allowed to compete! whereas Svetlana Grozdova turns to smile at us, just to show how easy it is. Maria Filatova and Natalia Ilyenko peruse the latest edition of the British gymnastics magazine. I like to think they were looking at an article I wrote about Filatova! A charming informal grouping from 1979. How many of these girls can you identify? And where are they all now? What lovely pictures - thank you so much for posting them. I think I can provide at least partial information for most of the gymnasts pictured, although others may be able to add more detail. 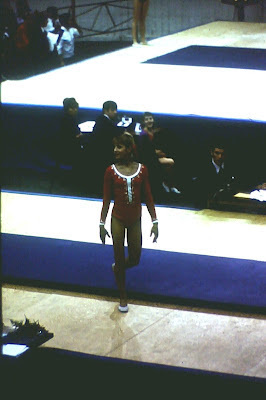 Natalia Shaposhnika - just inducted into the International Gymnastics Hall of Fame - coaches with her husband (ex Soviet gymnast) Pavel Sut in the USA. 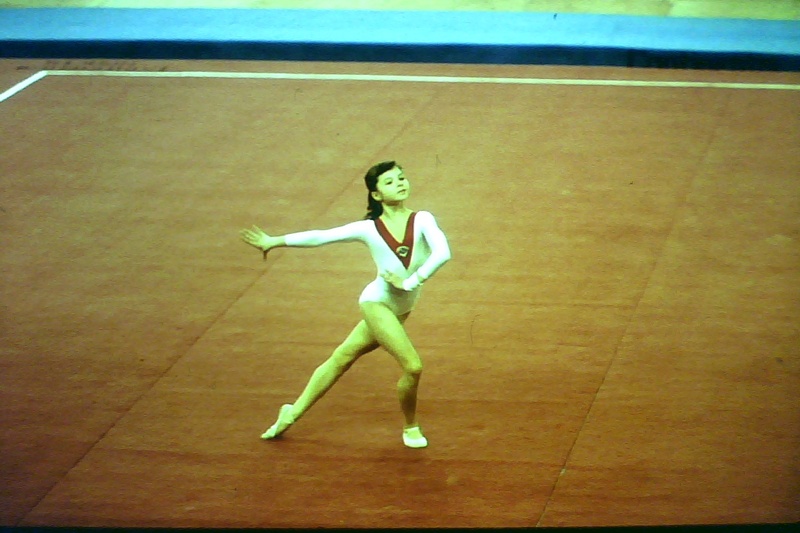 Natalia Ilienko - now married to a UK citizen and works as a coach or choreographer in the UK under her married name of Jarvis. Stella Zakharova still lives and works in Ukraine and has a competition named after her - she seems to be quite famous out there. I'm unsure who the lady is with them. It's sad in a way how many of them have had to leave their home countries to be able to make a living - it's also wonderful to see them all doing so well. 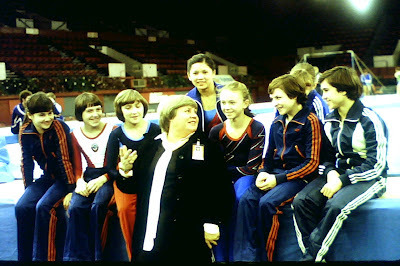 The blonde woman is one of the Soviet FX choreographers...maybe Galina Savarina? 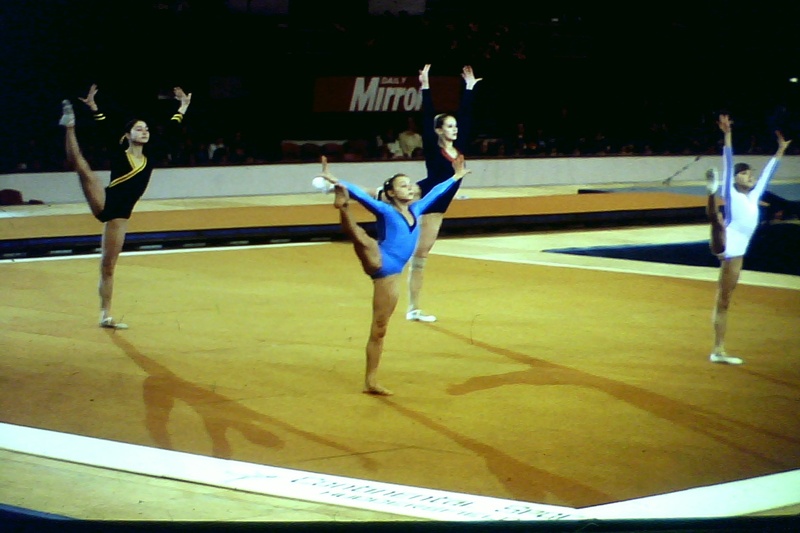 Correcting my previous entry above, the blond woman is choreographer Lidia Sokolova.